Thank you for visiting, and WELCOME to our web version of Alpine Real Estate's World Headquarters located in beautiful Bend, Oregon. It is our hope that this site will make searching for your next home or property as easy and comfortable as living in Central Oregon. We have designed this site to give you a one-stop web site for Central Oregon Real Estate. You can search our listings, and also search the entire Central Oregon Multiple Listing Service (MLS) from right here. You can also print reports, property listings/info, or e-mail maps and property information. We have set up links so that you can find out everything you'd need to know about a particular property. It is our hope that you will bookmark this site in your favorites and use it often as a resource. 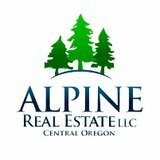 Alpine Real Estate was created in December of 2007, by local brokers and was formed out of a desire to help folks buy and sell property within a fun and spirited environment. An environment that is free from the typical large corporate rules and dominance. To create a unique company culture that focuses on family, loyalty, strong morals & ethics, and encourages a strong sense of good spirit & fun while conducting business in a professional and respected manner. We use the term "World Headquarters" out of pure fun and good humor, and because we have no desire to become a "corporate-like" giant in this business, merely to maintain a strong reputation as THE locally grown choice in real estate. Our Realtors include lifelong locals to Bend and Central Oregon. Our Alpine family of Realtors commands great depth of real estate experience, not only with successful contract negotiation, but professional and top-of-the-line listing representation, and the utmost in committed & loyal buyer representation. We are locally grown, bred, and Central Oregon proud. We have also included links to many of our favorite local websites so you can see the ski report or book a tee time, or see whats for dinner. It's all here!